John Terry and Roy Keane had a heated exchange on the touchline during Aston Villa’s win over Nottingham Forest on Wednesday night. The visitors came from behind to win 3-1 at the City Ground, keeping their playoff hopes alive with another crucial win as they now sit just two points adrift of sixth place in the Championship table. Things didn’t start well as they fell behind early on, but a double from John McGinn and a Kortney Hause goal after the break ensured that they returned home with all three points. 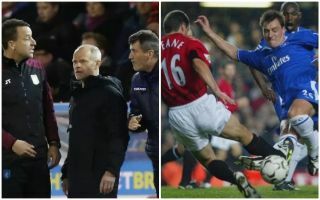 However, as seen in the image below, Terry and Keane had time to reacquaint themselves on the sidelines during the game, with the fourth official having to step in and keep them apart to avoid the situation escalating. It’s unclear as to what the disagreement was over, but clearly the two Premier League legends had a difference of opinion on something, and were eager to share their view with each other. Both men are currently working as No.2s to Dean Smith and Martin O’Neill respectively, but evidently they like to take a hands on approach on the touchline too. Terry got the last laugh on this occasion though, with Villa picking up the all-important win in the battle for promotion.